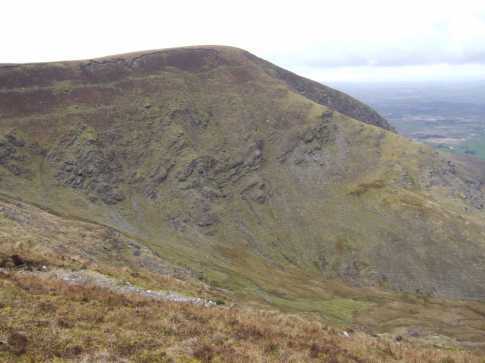 The name Glanaprehane probably refers to the steep glen N of Caherbarnagh rather than this peak. Caherbarnagh NW Top is the 162nd highest place in Ireland. Caherbarnagh NW Top is the second most northerly summit in the Paps/Derrynasaggart area. The summit overlooks great areas of Cork farmland and some of Kerry. There is a good view of the gracious Paps to the SW. 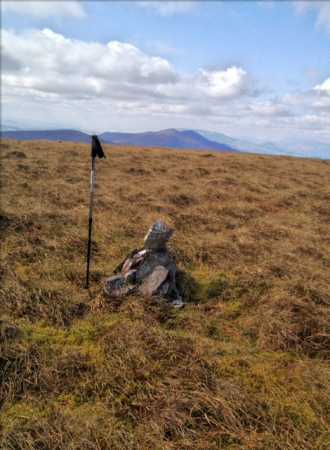 It can be reached from the Duhallow Way to the north and east, with particular starting points such as W196893 A or W177850 B. 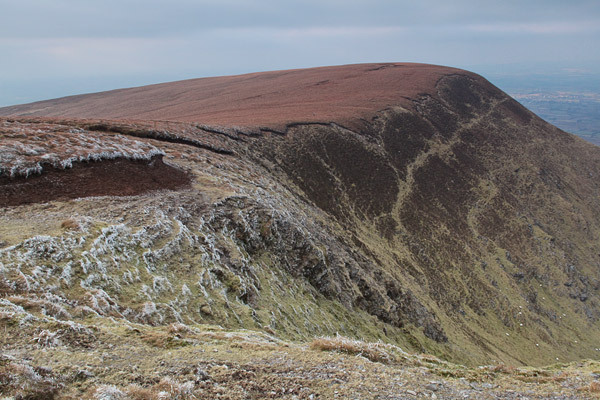 Or make it part of a ridge walk from Caherbarnagh from which it is separated by around 650m and a NE facing corrie. The Derrynasaggart mountains would not win any awards for their looks. that have made many a better man than me reach for his Lucozade. Look again though and the rich geological history of the area comes to light. older Namurian rocks to the north divided by the Killarney/Mallow faultline. fault scap which is visible in a only few places such as Lough Gortavehy. betraying the outpourings of lava and volcanic deposits in the late Devonian era that formed them. But enough of the geology lesson, what of the views? what of the views! On a clear day in early March, the snow capped Kerry Highlands....... magnificent! Approached Caherbarnagh NW from Knocknagowan via Caherbarnagh, I had planned to head on to Knocknabro and back up the road in Clydagh valley, but the going is so tough over the tussocky boggy ground from Clydagh I decided to head back the way I came. The views to the North are lovely and the valley between Caherbarnagh NW and Caherbarnagh looks like a great climb, I'm sure it's horribly slippery though.